What is the Portable Compliant Isolator (PCI) ? 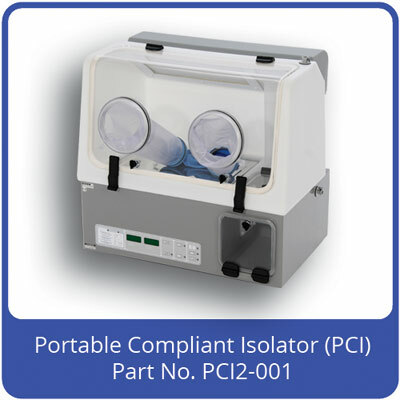 PCI stands for Portable Compliant Isolator. As the name suggests, it a small glove box capable of mobile operation. The term compliant relates to the various international standards and guidelines for clean air devices and isolators for example: BS EN 12469:2000 Performance Criteria for Microbiological Safety Cabinets ; BS EN ISO 14644-7:2004 Clean Rooms and Associated Controlled Environments ; H.M.S.O Isolators for Pharmaceutical Applications. Despite its small size, the PCI totally complies with all these. The world's only compliant portable bench top isolator. The PCI has application to any work that requires operator protection, product (patient) protection, or both. The work might be medical in nature such as chemotherapy, or it could be analytical such as sample diagnostics. The PCI may also be used for micro-electronic application such as data recovery (rebuilding damaged disk drives) etc. The PCI draws HEPA filtered air from the environment and returns it via a dual-in-line HEPA filter. Two fans located in the base of the unit are used to supply and exhaust the air in a 100% 'Push-Pull' configuration. This type of design means that both the Air Change Rate (ACR) and Internal Pressure can be independently controlled and the isolator may also be run at a positive or negative pressure. The front panel allows selection of the operating mode, and the ACR and internal pressure are automatically controlled at preset conditions. All electrics including the elevating trolley and LED light are low voltage (24 VDC) allowing the system to be run from internal batteries or a commercial vehicle. The PCI has a 12L transfer hatch which is also flushed with HEPA filtered air. The PCI is the only fully compliant mobile isolator in the world. It takes up very little space, costs about 1/3 that of its full-size counter-part and is easy to use. There are many applications such as clinical trials, chemotherapy and radio-isotope treatments that require a safe/clean mini-environment close to the patient, rather than in the central sterile suite. The PCI is ideal for this type of work and is generally available ex-stock so that acquisition is cost-effective, simple and quick. The PCI is also available as a military variant - please see the Defence Section.